The Atlantic sailfish (Istiophorus albicans) is a species of marine fish in the family Istiophoridae of the order Perciformes. It is found in the Atlantic Oceans and the Caribbean Sea, except for large areas of the central North Atlantic and the central South Atlantic, from the surface to depths of 200 m (656 ft). 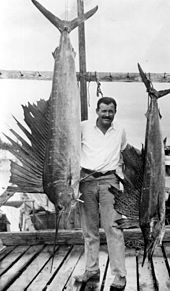 The Atlantic sailfish is related to the marlin. Atlantic sailfish hunt schooling fish, such as sardines, anchovies and mackerel although they also feed on crustaceans and cephalopods. In previous studies, sailfish hunting schools of sardines rely heavily upon stealth and quick slashing or tapping with the rostrum in order to temporarily immobilize prey and facilitate capture in small prey. The adaptive advantage of the bill is highly debated and many different functions have been suggested. The bill has been hypothesized to increase the hydrodynamic qualities of the fish and even to ward off predators. However, it has been well documented that the sailfish utilizes the bill in hunting. ^ Burton, M. and Burton, R. (2002) International Wildlife Encyclopedia. Marshall Cavendish, New York. ^ "Atlantic sailfish". ARKive. Archived from the original on 2013-12-28. Retrieved 2013-12-27. ^ a b c Froese, Rainer and Pauly, Daniel, eds. (2006). "Istiophorus albicans" in FishBase. January 2006 version. "Istiophorus albicans". Integrated Taxonomic Information System. Retrieved 6 June 2006.